Circle dance has developed from tradition folk dances around the world with people who have dementia and their carers in mind. The Benefits of Circle Dance include the following. The music and dances are from various countries and often relate to community events such as weddings, birthdays and the year’s seasons. 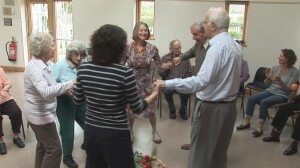 The Circle Dance training course carried out by our instructors was fully endorsed by Dementia UK. For more about Circle Dance including some videos please click HERE.